This has to be, hands-down, one of my favourite designs ever. I loved working with the Blacker Swan over-dyed Falklands Merino DK in the sample and the colours (while not to everyone’s taste, I will admit) are totally “me”. This side-to-side shawl/scarf features lace, cables, garter stitch, and intarsia. The shaping for the shawl is done within the garter stitch section. The lace and the cables are all fully charted. 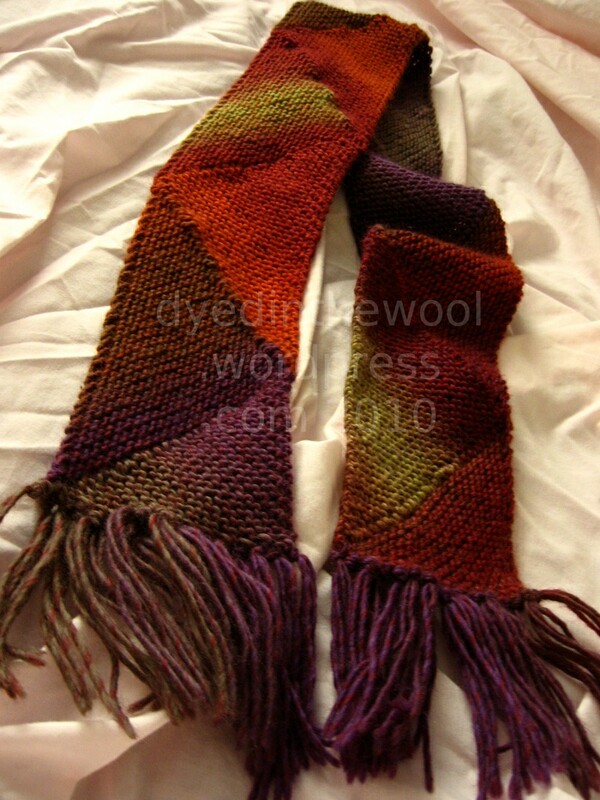 The ends of the shawl are shaped, with the cables growing gracefully out of and into the points. This pattern features in the revamped Knit Now issue 45, available in selected UK newsagents and supermarkets or online (internationally) in paper or digital format from More Mags. These ultra-feminine fingerless mitts were inspired by the big, busy prints seen on the Spring/Summer 2013 runways and the little cream lace on the cuff echoes delicate ladies’ gloves trimmed with broderie anglaise. Although the Shetland wool, at first, may not scream summer, I always keep a pair of fingerless mitts with me for those chilly days on the beach or cool evenings in the garden. Make in bold colours for a statement or pastel shades for a more delicate feel. I think these have to be the most feminine things I’ve ever designed, and I love them! They turned out pretty much as I had envisioned them, which is not always the case! It was a tricky “birth” but I got there in the end. 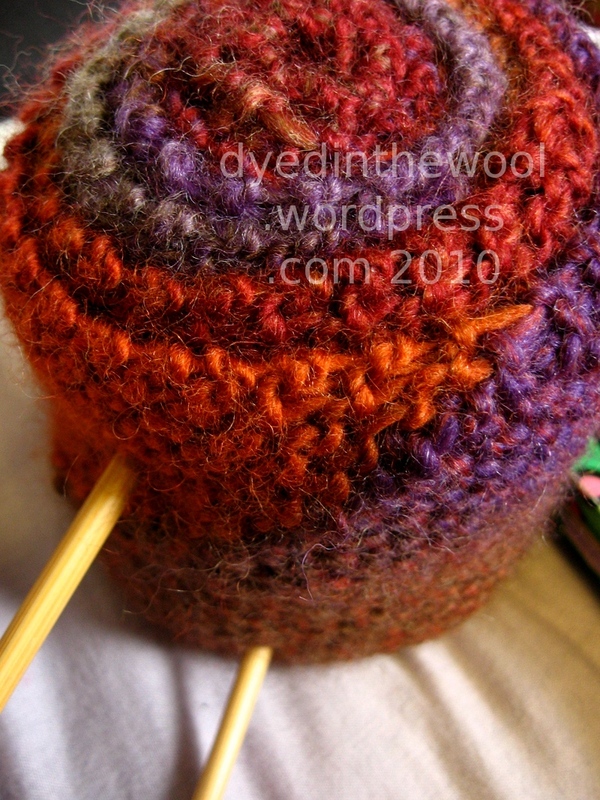 Yarn: Ripplecrafts Shetland 4-ply in The Bru (and yes, it really is that orange! ), Ecru, Wild Violets and Primrose. Note: there is a code in the magazine for 15% off the yarn used from Ripplecrafts. Wardown Mitts are in Knit Now issue 24, on sale from the 25th July 2013 from moremags.com (who ship/post overseas) and selected supermarkets in the UK. If in doubt, do what someone else tells you to do. Also, I’ve mainly been knitting on the Cria cardigan and it’s just miles of stocking stitch with the occasional buttonhole. This photo challenge comes from WordPress. Poor short-term memory = Post-it notes! I’m actually a day late (the new challenge is out today) but I thought I’d share anyway! Click on any of the images in the gallery above to get a larger photo (you will then be able to scroll through all of the pictures). 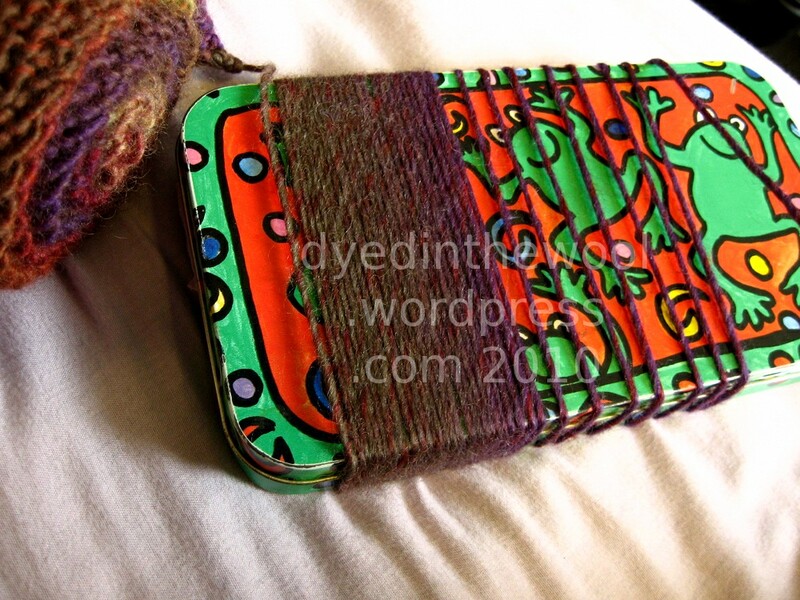 I can agonise over putting the right yarn with the right pattern. It can take me hours, days or, in some cases, years on I still haven’t found The One. Finding the perfect pattern for the Rico yarn I blogged about last week didn’t take that long. I tried it with an entrelac scarf pattern first and while the technique lends itself to striping yarn, it didn’t work with this one (colour change was too long). 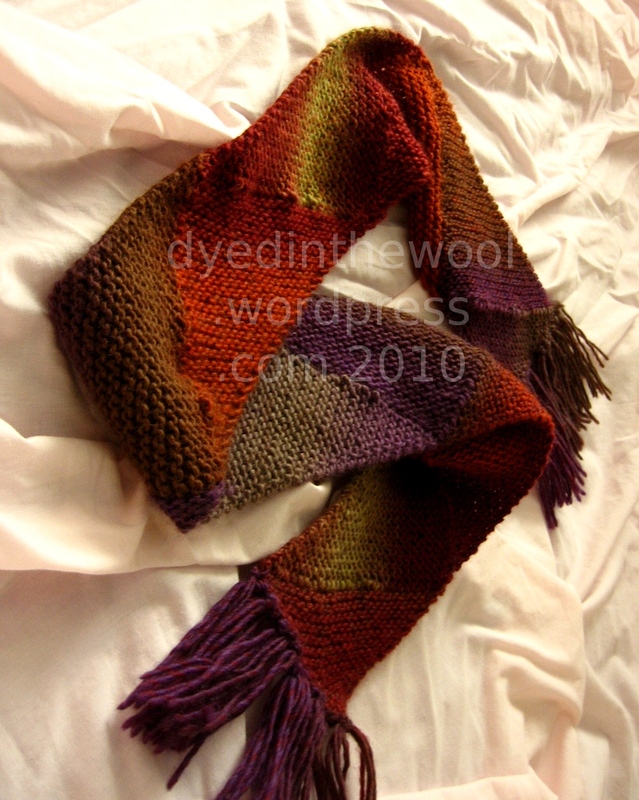 I then went looking for one of those multidirectional scarf patterns that were all the rage when I first started knitting. And I found one. and on Sunday evening, I finished! No modelled shots because I look a grim at the moment. A vertigo attack (dizziness) combined with giant swollen neck glands doesn’t lend itself to making very pretty photos! Size: 4″ wide by 50″ long without fringe and 58″ with fringe. I didn’t win the Summer of Socks design contest, but I’ll make the Turning and the Apple pattern available to buy in a few days, after I’ve posted the “Finished Object” post. The following is partly for her, and partly for me. I’m currently planning what I’m packing for my trip in October and it’s really got me thinking about colour. So, here goes! 1. What is your current favourite colour? Hmm … I’d probably have to say orange or purple. 2. Had your favorite color changed over the years? No – it’s pretty much always been purple! I have no idea. I vaguely follow “trends”, by which I mean I notice them, but rarely slavishly give into them. 4. What is your favorite color combination? Hot pink and sunset-orange, or red and black. Seriously, I like all those techniques for different reasons and different purposes. I tend not to do simple stripes unless it’s on socks, but I don’t shy away from automatically-striping yarn in garments. 7. What colors look good on you? 8. What colors look bad on you? Yellow, lime greens, stark white or black. 9. Do you wear colors that don’t look good on you just because you like them? No. Apart from black and white, I tend to avoid them. 10. What is your favorite neutral color? black/white/ivory/tan/brown/gray – if brown or gray do you prefer cool or warm versions of those or does it matter? And, how dark? Currently, it’s brown. I gravitate towards chocolate-type shades. 11. Is there a sweater pattern that uses more than one color that you’d like to make, but you wish to change the colors from what is published? If yes, which one? What do you not like about the published colors? I can’t think of one off the top of my head, but if there was one I was lusting after, I would almost certainly want to change the colours! It’s very likely that I’d want to substitute the yarn in the first place, but it’s highly unlikely that the published colours would be those I’d like to wear. I have a fair amount of confidence in choosing colours, but I like patterns that provide alternatives and suggestions for colour schemes (such as Philosopher’s Wool).